^ 1.0 1.1 1.2 1.3 1.4 1.5 ‘A Taxi Driver’ to open worldwide next month. Korea JoongAng Daily. 2017-07-18 [2017-08-10]. （原始内容存档于2017-08-06）. 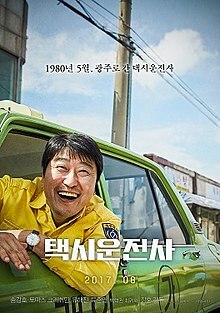 ^ S. Korean Movie “A Taxi Driver” to be Released Internationally. KBS World Radio. 2017-07-17 [2017-08-10]. （原始内容存档于2017-08-02）. ^ "영화 '택시운전사' 1973년식 브리사 택시 복원에만 7개월". Yonhap News Agency. 2017-07-16 [2017-08-10]. （原始内容存档于2017-08-03）. ^ Taeksi Woonjunsa. The Numbers. [2018-02-01]. （原始内容存档于2017-09-16）. ^ Big-budget movies to highlight 2017. 2017-01-16 [2017-07-01]. （原始内容存档于2017-08-02）. ^ Herald, The Korea. Song Kang-ho to star in ‘Taxi Driver’. 2016-05-03 [2017-07-01]. （原始内容存档于2017-07-30）. ^ SONG Kang-ho Takes Lead in TAXI DRIVER Depicting the Gwangju Democratization Movement. [2017-07-01]. （原始内容存档于2017-08-03）. ^ 9.0 9.1 9.2 回到1980！柳俊烈＆宋康昊＆劉海鎮新片劇照首次公開. 2017-03-28 [2017-07-01]. （原始内容存档于2017-08-03）. ^ 제90회 아카데미영화상 외국어영화부문 한국영화 출품작 선정 결과. 2017-09-04 [2017-10-03]. （原始内容存档于2017-09-04）. ^ Kil, Sonia. Korea Hails ‘A Taxi Driver’ For Oscar Race. Variety. 2017-09-04 [2017-10-03]. （原始内容存档于2017-09-04）. ^ 柳俊烈加盟電影《計程車司機》 搭檔影帝宋康昊. 2016-05-30 [2017-07-01]. （原始内容存档于2017-06-28）. ^ Jon Maala. Taxi Driver dislodges Battleship Island from top of Korean box office. International Business Times. 2017-08-03 [2017-08-10]. （原始内容存档于2017-08-04）. ^ 'A Taxi Driver' tops 1 mln in attendance on 2nd day. Yonhap News Agency. 2017-08-03 [2017-08-10]. （原始内容存档于2017-08-04）. ^ 'A Taxi Driver' audience tops 2 mln by third day. Yonhap News Agency. 2017-08-04 [2017-08-10]. （原始内容存档于2017-08-07）. ^ 'A Taxi Driver' tops 5 mln on 7th day. The Korea Herald. 2017-08-08 [2017-08-10]. （原始内容存档于2017-08-10）. ^ (LEAD) 'A Taxi Driver' tops 5 mln on 7th day. Yonhap News Agency. 2017-08-08 [2017-08-10]. （原始内容存档于2017-08-10）. ^ ‘택시운전사’ 700만 관객 돌파…올 영화 중 최단 기록 ['Taxi driver' surpasses 7 million viewers ... The shortest of all films]. Star Financial News. 2017-08-12 [2017-08-19]. （原始内容存档于2017-08-14） （韩语）. ^ <택시운전사> 700만 관객 돌파, 올 개봉작 중 최단 기록 [<Taxi driver> 7 million passengers, the shortest of all releases]. News Khan. 2017-08-12 [2017-08-19] （韩语）. ^ 'A Taxi Driver' surpasses 8 mln in attendance, becoming most-viewed film this year. Yonhap News Agency. 2017-08-14 [2017-08-19]. （原始内容存档于2017-08-15）. ^ Lee Hyo-won. South Korea Box Office: Local Drama 'A Taxi Driver' Becomes Top Film of 2017. The Hollywood Reporter. 2017-08-14 [2017-08-19]. （原始内容存档于2017-08-15）. ^ Jonathan Hicap. Korean president watches hit movie ‘A Taxi Driver’. Manila Bulletin. 2017-08-16 [2017-08-19]. （原始内容存档于2017-08-17）. ^ Jon Maala. 'A Taxi Driver' sets box office record with 10 million audience. International Business Times. 2017-08-20 [2017-08-21]. （原始内容存档于2017-08-21）. ^ Lee Mi-young. '택시운전사', 올해 첫 천만영화…장훈 감독 "뜻깊고 기뻐". eNews24. 2017-08-20 [2017-08-21]. （原始内容存档于2017-08-21） （韩语）. ^ Kim Jae-heun. 'A Taxi Driver' attracts 10 million moviegoers; 15th Korean film in history. The Korea Times. 2017-08-20 [2017-08-21]. （原始内容存档于2017-08-21）. ^ Shim Sun-ah. Two Korean films sweep weekend box office. Yonhap News Agency. 2017-08-21 [2017-08-21]. （原始内容存档于2017-08-21）. ^ Jin Min-ji. [Korean Box Office] Star-studded ‘V.I.P.’ debuts strong despite criticism. Korea JoongAng Daily. 2017-08-28 [2017-08-29]. （原始内容存档于2017-08-29）. ^ 택시운전사가 1천200만 역대 10위의 고지를 넘었다. 박세회. 2017-09-09 [2017-09-10]. （原始内容存档于2017-09-10）. ^ 《我只是個計程車司機》網路話題熱議 首周全台票房約850萬 好評口碑暴走 全台熱映中. GaragePlay. 2017-09-12 [2018-12-13]. ^ 《我只是個計程車司機》逆勢成長 全台票房破兩千萬！獲蔡英文總統、陳菊市長關注 盼從歷史獲得啟發. GaragePlay. 2017-09-19 [2018-12-13]. ^ Yun Suh-young. Widow of German reporter Jurgen Hinzpeter to visit Seoul. The Korea Times. 2017-07-31 [2017-08-19]. （原始内容存档于2017-08-02）. ^ (LEAD) Moon watches movie about Gwangju uprising. Yonhap News Agency. 2017-08-13 [2017-08-19]. （原始内容存档于2017-08-15）. ^ 這電影把總統一家都吸引來了！ 與宋康昊、柳海真、男主角遺孀共賞佳作，感動到流淚！. 韓星網. 2017-08-14 [2017-08-19]. （原始内容存档于2017-08-19）. ^ Moon Jae-in visits showing of ‘A Taxi Driver’. JoongAng Ilbo. 2017-08-14 [2017-08-19]. （原始内容存档于2017-08-18）. ^ Kim Rahn. Presidents' choice of films shows political messages. The Korea Times. 2017-08-14 [2017-08-19]. （原始内容存档于2017-08-15）. ^ 出租车司机. 豆瓣电影. [2017-10-03]. （原始内容存档于2017-09-10）. ^ 出租车司机 A Taxi Driver(2017). movie.mtime.com. [2017-10-03]. （原始内容存档于2017-10-03）. ^ 부일영화상. Buil Film Awards. （原始内容存档于2017-10-02）. ^ Song Kang-ho Wins Best Actor at Fantasia Film Fest. The Chosun Ilbo. 2017-08-04 [2017-09-09]. （原始内容存档于2017-08-04）. ^ Hong Dam-young. Song Kang-ho of ‘Taxi Driver’ wins best actor award at Fantasia Film Fest. The Korea Herald. 2017-08-05 [2017-09-09]. （原始内容存档于2017-09-08）. ^ 54th Daejong Film Awards (Grand Bell Awards) 2017. HanCinema. 2017-09-29. （原始内容存档于2017-10-01）. ^ THE FORTRESS Dominates 37th Korean Film Critics Association Awards. Korean Film Biz Zone. 2017-10-30. ^ ‘제1회 더 서울어워즈’ 노미네이트 공개, 이보영 지성 김희선 조승우 등 화려한 라인업 공개. Naver. 2017-09-28. ^ '택시운전사', 美 AWFF 3관왕 '쾌거'…아카데미 주목할까. News1. 2017-11-06. （原始内容存档于2017-11-08） （韩语）. ^ Jon Maala. 'A Taxi Driver' bags best film plum at Asian World Film Festival. International Business Times. 2017-11-07. （原始内容存档于2017-11-08）. ^ 유원정 기자. 38회 청룡영화상 후보작 발표…'불한당' 최다 노미네이트. 2017-11-06 [2017-11-07]. （原始内容存档于2017-11-07）. ^ Asian Film Awards 2018 nominations. South China Morning Post. January 11, 2018.